My name is Kim Keil, my husband and I designed and built the first Training Room in our hometown of Brighton. I have dedicated my life to being a Personal Trainer for the last 6 years in the homes of clients and small studios. I have spent my life in a gym since I was a small child. I was a gymnast in the Brighton area for 16 years and helped build the Brighton Gymnastics team by winning State Champ on floor exercise my junior year. After I got a degree in Business Management I decided that Personal Training was what I wanted to do. I attended The National Personal Training Institute and received my certification in Personal Training. I love helping people every day live a healthier lifestyle and make fitness a habit they can’t live without. We opened this gym hoping to start a small workout family. So far, it is all family. I love my gym family. Visit our contact page to schedule an appointment with me today! My own motto that I've created within the 5 years of my training career to help inspire and motivate each client every step of the way. A fitness journey should never be only about the physical Expedition; it should also be about strengthening the mind so you can tell yourself that 'you can do anything'. This journey should also be about having fun, sweating hard and being creative with workouts, regardless of one’s limitations or modifications, so that they can feel strong, powerful and confident in their own skin-both physically and mentally. I am so deeply passionate about what I do that I insist on making each client and new opportunity that crosses my path a learning experience. With each new experience, I not only enhance my knowledge in my career, but I enhance my client's program foundation so that they get exactly what they need for their body. Together as a team, we will succeed! My name is Kailey hegle and I am super excited to be partnering with the Training Room Brighton as the new fitness nutrition coach. I’m a busy mom and wife so I can relate to the challenges that come with having a busy schedule and wanting to live a healthy lifestyle. I have 4 years experience helping other women learn to make healthier food choices, develop a good relationship with food, create balance in their lives and develop a plan that fits you and your lifestyle. I offer one on one nutrition coaching as well as virtual coaching services. My passion is helping others become the BEST version of themselves and get to a place where they’re proud of the body they have and feel good each day.. Please contact me to set up a free consultation and we can discuss the type of program that would fit you and your goals. Hello, my name is Shane Bright, I graduated from Eastern Michigan University with my Bachelor’s in Exercise Science. After obtaining my degree, I became certified as a Personal Trainer through the American College of Sports Medicine. In 2016, I took part in an internship with the University of Michigan Olympic Sports Strength and Conditioning where I trained athletes from 12 different sports. I am EXCITED to share my knowledge and passion with you! For me, it’s a mutualistic relationship because as I do my best to make clients become their best version, I also learn something with each new client experience which allows me to become a better fitness professional. Because every body is different, I am a great believer in specificity; therefore I provide everyone with an exercise prescription that is tailored to their particular goals. Exercise and sports have been lifelong passions of mine. In high school I played football and ran track and field eventually becoming an all-state high jumper. Other than weightlifting, I enjoy staying active by swimming, hiking, playing basketball, volleyball, and ping-pong. Nutrition is also a passion of mine, and I’m a firm believer in letting Mother Nature’s food be thy medicine. Health and fitness has been my life since I graduated highschool. When I first got started I wanted to make a change for myself. After doing so, I knew I wanted to help others change their lives the way fitness helped change mine. I am beyond passionate about what I do and take a lot of pride in helping my clients change their lives to a happier and healthier version of themselves. 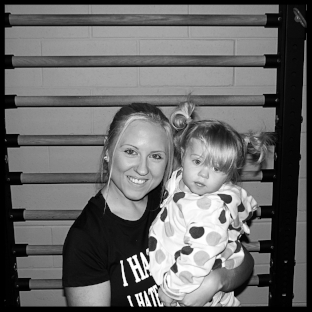 I have been overweight, underweight, competed in fitness competitions, and now I am a mother and wife living a healthy lifestyle for myself and my family. I want to show people, no matter where you are in life, anything is possible if you are willing to work. If you are going to do one thing for yourself, let this be it. Changing your lifestyle around for the better is the best thing you can do! I have been teaching group fitness for 16yrs. My background is in circuit training, kickboxing, Les Mills, Piloxing Barre, TRX, Pilates & Spin. I will be a Registered Yoga Teacher in December 2016. I enjoy teaching and making people feel good. I'm married with a son and two stepchildren. I love giving positive energy to my classes and my everyday life. "I don't just build strong temples; I help build strong Empires."